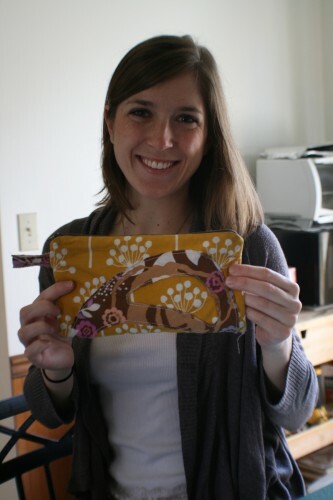 I made this bag for Anna back in December for her birthday- I just forgot to photograph it and post it! So recently when she visited, we took a quick pic so that I could post it. The bag has an “A” on it for Anna, it’s a zipper closure, and the inside, which we forgot to photograph, is pink with white polka dots. She loves it and uses it all the time! The bag is cute, but I have to say, the model is a thousand times cuter! Love you, Banny! This entry was posted on April 5, 2012. It was filed under Sewing.